For most lids, these standard liners can be provided by PET Power in one package. Do not hesitate to contact us, so we can examine which liner is best suited to your product. An EPE liner is a white foam sheet inside the lid. 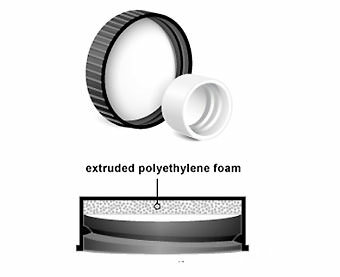 When the lid of a container is closed, the rim of the container pushes against the EPE liner. This way, the container is well sealed and it prevents leakage. EPE liners are available in different thicknesses. EPE can also be combined with an IHS liner. PET Power can offer you a tailor-made combination. A PS liner has adhesive on one side, designed to stick on to the rim of a container. 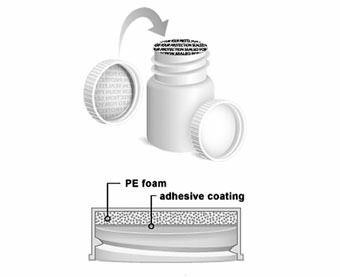 When a container is closed and pressure is applied to the cap, the adhesive becomes activated, which creates a seal. When the customer opens the container, he or she will have to pull the seal off in order to get to its content. This liner protects the product and the consumer is certain that he or she is the first to actually use it. The PS liner is often applied to food products. An IHS liner is sealed on the rim of the container using induction heat. This is the most common type of seal. PET Power supplies the IHS liner in different versions, such as a mono-seal, a seal on a cardboard carrier or with a lift and peel tab to facilitate pulling the tab from the container. 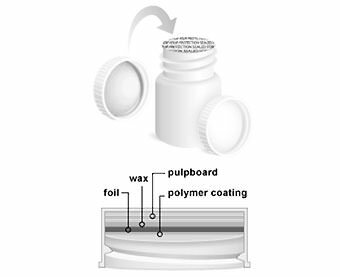 Some IHS liners are better suited for products containing oil and others are better suited to powdered products. Yet another prevents loss of flavour or leakage. Please contact us, so we can effectively align your product with the proper liner.